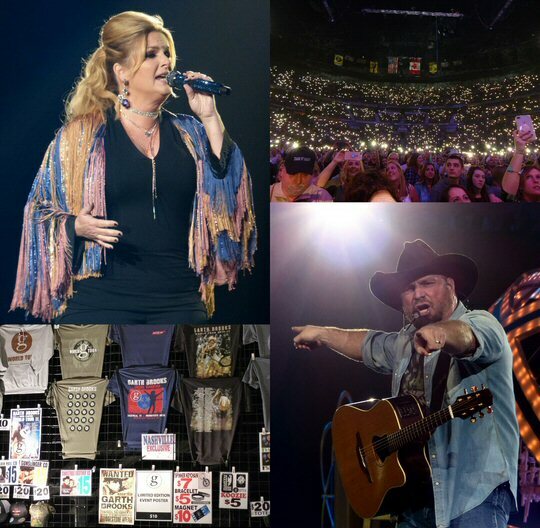 It was seven years ago when Garth Brooks broke from his self-imposed retirement to help Nashville recover from the floods that decimated much of Music City and beyond. To contribute the performer played a stunning run of nine dates just up from the Cumberland River on Broadway. Garth Brooks is conquering king of the comeback in Nashville. In 2017, Garth returned to the Bridgestone Arena in Nashville, Tennessee for a much more celebratory seven nights. From December 9th through the 23rd the chart topping singer and songwriter sold-out the venue to complete a successful world tour that started back in Chicago in 2014 with his wife Trisha Yearwood. In the beginning (1989), Garth gained immense popularity with his innovative integration of rock elements into the country genre. Brooks a best-selling solo artist with a barge full of records sold is also a top touring artist known for lively live performances. Now, Brooks is bringing his current record setting comeback to a close. On December 16, 2017, he played his fourth Bridgestone show to a capacity house. The recent world tour has been nothing short of an amazing good ride indeed! Garth Brooks has had an amazing career and to confirm that a dizzying scroll of statistics greeted the audience via the big screens moments before the man himself took the state-of-the-art stage packed with amps, gear and lighting rigs which included a colorful circular cage around the drum kit. Yet for all the spectacle Brooks was simply clad in a cowboy hat and denim. The crowd was on their feet from the first note to the last ready to clap and sing along to a boat load of hits. Garth was giddy much of the night, laughing to himself, seemingly bemused that his faithful fans still love him as much as they do. "Hello Nashville, thanks for letting us come back," gushed Garth. He shared that he goes to a show to "hear the old stuff" then joked that "I am the old stuff". Brooks' engaging and energized performance was anything but old. Garth easily worked the crowd and stage making a point to play to all sides of the arena throughout the night. Brooks' close to three hour set was flooded with fan favorites such "Baby, Let's Lay Down and Dance," "Rodeo," "The River," "Ain't Goin' Down ('Til the Sun Comes Up)," "Papa Loved Mama," "Thunder Rolls" and so much more. Trisha and Garth in Nashville. Brooks brilliantly blended acoustic numbers with animated songs while fully utilizing effects which included the drum circle elevating above the stage. Later, Trisha Yearwood came up through the floor to join her husband on "In Another's Eyes." Garth then departed as Trisha performed a number of her popular tunes allowing Brooks to take a breather and his hard working band got a break when Garth played acoustic. During the show Garth introduced his talented team with a number of them (Dave Gant & Mike Palmer) being with him since day one. He also gave a shout out to his lighting guy. During the classic "Friends In Low Places" Garth said the concert was being recorded for a live album and he needed the audience to sing the third verse. For a job well done we were rewarded with canons of confetti. 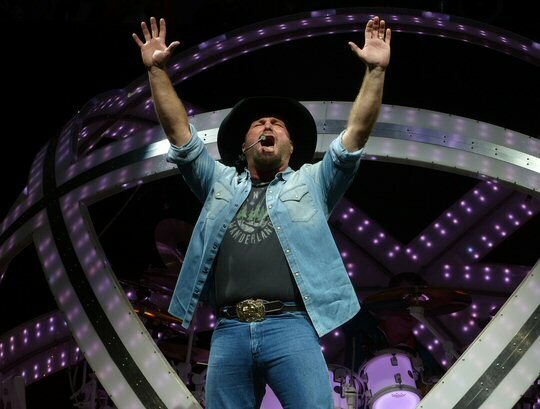 As Garth performed the closer "The Dance" he declared "best night ever in Nashville" but Brooks returned quickly for an extensive encore. At this point he peered out into the audience for the signs. The first request was the sentimental "Mom" performed solo by Garth armed with an acoustic. Garth and crew really lit it up in Music City. 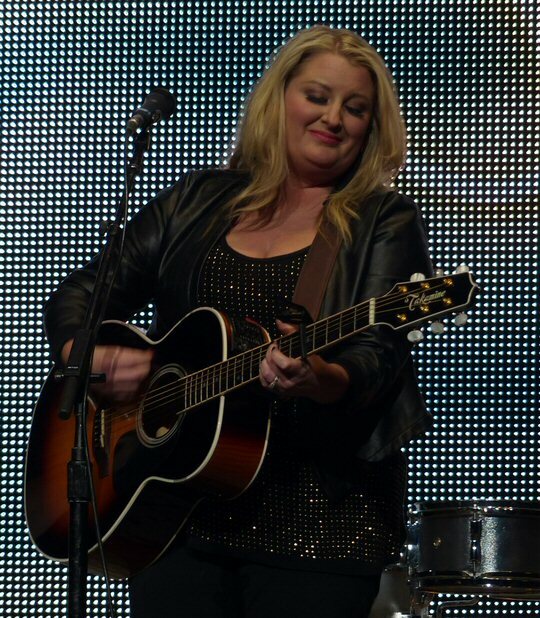 Another fan wanted to hear "Walk Away Joe" so Trish sang the story as Garth gently strummed the guitar. One lady got her wish for "She's Every Woman" because she taped peanut M&Ms to her poster which Garth gladly accepted. Another person had written she was a cancer survivor and a mom of six. Brooks revealed he was the last of six as he asked the women some questions before playing "Red Strokes" for her. "I am a huge Nitty Gritty Dirt Band fan" enthused Garth before he covered their "Fishin' in the Dark". The fiery Saturday night slot finished with a sizzling version of "Standing Outside the Fire". Garth Brooks presented the old stuff along with some newer tunes with youthful enthusiasm even after three years on the road. In addition to an animated career spanning set fans were treated to a star studded night featuring music from award winning Trisha Yearwood who has sold more than 15 million albums worldwide and has also released three successful cookbooks. 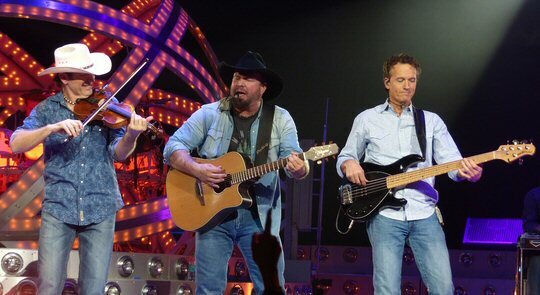 Garth and band brought the jam to country music much of the night. Chris Young a recent inductee into the Grand Ole Opry was a stellar surprise guest and Karyn Rochelle a respected artist kicked off the night with a short but strong set of songs before returning to the Bridgestone stage as part of Brooks' Wall of Sound singers. Although Garth's Nashville shows are sold out its worth a try to see if any tickets are still available as Garth Brooks proved on the 16th that he is still a country superstar for the ages. 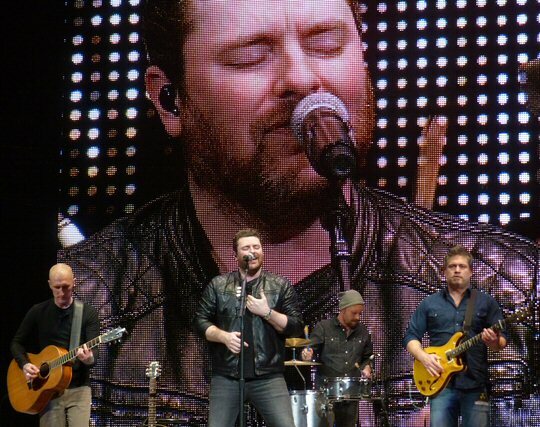 A captivating Chris Young - the newest member of the Grand Ole Opry - preceded the headliner. The Bridgestone Arena in the heart of downtown Nashville is home ice for the Predators. 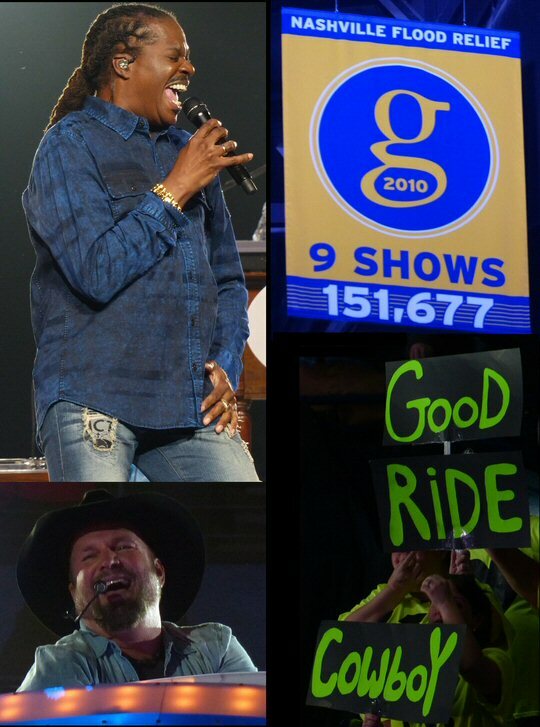 It also hosts a wide array of concerts such as Garth Brooks. Upcoming events at the venue include Cirque Musica, Jimmy Buffett, Monster Jam, Avenged Sevenfold, Kid Rock and the Harlem Globetrotters. Show opener Karyn Rochelle was also a potent member of the Garth Brooks band.